A perfect tan begins with Get Buffed Pre-Tan Body Scrub. Formulated with natural exfoliators plant extract and vitamins exclusively designed to maximize and enhance your sunless tanning results. Use prior to the initial application of Pro-Tan sunless ta nning formulas. 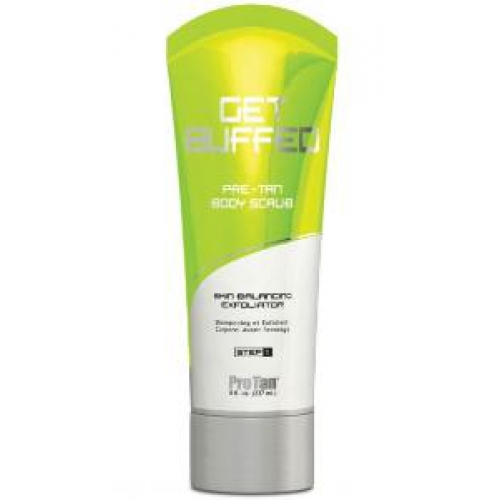 Get buffed assures a deeper darker longer-lasting tan. This gentle smooth action wash softens your skin texture leaving it feeling fresh and clean while the awakening aroma of fresh cut mangos and limes leave your senses soaring. Purified Water Sodium Lauryl Sulfate Glyceryl Stearate Oleyl Betaine Pumice Peg 100 Stearate Imidazolidinyl Urea Methylparaben Allantoin Propylparaben Potassium Sorbate Retinyl Palmitate (Vitamin A) Tocopheryl Acetate (Vitamin E) FragranceK ola Extract (And) Green Tea Extract (And) Red Clover Extract (And) Licorice Extract (And) ArnicaExtract FD&C Blue No. 1 FD&C Yellow No. 5. Prior to initial application of protan sunless tanning formulas apply a generous amount of scrub onto palms while showering. Message over entire body then rinse. For external use only. Avoid close contact with eyes. Discontinue use if irritation occurs.